I don't think internal outhauls are specific to Catalina so I posted this here instead of the C30 forum. According to my C30 manual the internal outhaul has a wire lead from the clew to a sheave leading it into the boom to a block. From the block double braid line is run to give a 3-1 purchase. Pic below. Catalina Direct offers a 10-1 purchase setup that adds another wire lead after the first one, then more blocks wove with double braid line. Pic below. My question is this: Does the wire line have advantages in this type of setup or can I plan to use all double braid line? Wire was used in stretch-critical running rigging before the advent of spectra-cored line. Now you could use very low stretch line (spectra core), or just dyneema. Thats what the builders started to do in the 90s. I bought the 10:1 from CD for my 36. And ran it back to the companion way. Wire doesn’t stretch. The double braid has lower tension so overall stretch is less. The existing blocks where totally worn and I would have replaced them anyway. I went with the CD package cause it should have All just fit. It didn’t I ended shortening the wire about 12”, which is the difference between the boom length on std rig vs tall rig. I agree that replacing the wire with single braid dyneema would work well. An equivalent strength double braid polyester would be too damn big... Nothing wrong with wire though.. you can build that piece over at the WM work bench, right in the store. If you switch to line, then the blocks will probably need to be larger. While a hi-tech line like dyneema would have very little stretch, a good quality dacron line would also work. It will stretch more, however, the lines are relatively short and while under tension it will not be as much tension as a jib halyard and much of the tension will be spread over several short line segments. I doubt any mere mortal can develop 300# of tension on an outhaul without the help of a winch. And if you are not racing a little stretch really won't matter much. The inherent weakness of all of the older Catalina inside outhauls is that they used swivel blocks! Part of the fix is to get fixed sheaves. Whether you choose to continue with 3:1 or higher ratios is only half the problem. Stu I don’t believe the upgrade kit CD sells has swivel blocks. By all means if you are going to the effort to replace the wire and line for the outhaul, replace the blocks with ball bearing blocks. Friction is a killer, especially if you have a shelf-footed main. I agree. Maybe I wasn't clear: the old ones, OEM, from the factory, a long, long time ago in a galaxy far, far away. The inherent weakness of all of the older Catalina inside outhauls is that they used swivel blocks! Part of the fix is to get fixed sheaves. My concern about eliminating the wire line was more about whether it somehow contributed to preventing twist. Stu explains that issue so fixed blocks, @dlochner with BB sheaves , it will be. After I open up the boom I will figure what size blocks I can use. Boom is in the basement, waiting for the PB Plaster to help loosen the end caps. I'm already planing on replacing the boom end and mast end exit sheaves with BB sheaves that are sized for line rather than wire. @LeslieTroyer told me earlier he used the CD kit and liked it. But, I'm always over thinking things and think that while the CD kit would work, I can duplicate the system using line and blocks I purchase for half the cost. For the line I'm thinking 1/4" or 3/16" dyneema to replace the wire line, then a lower stretch 5/16" double braid. I will be running it back to the cockpit. The another thing I'm doing to complete the outhaul system is sewing up a clew strap using dyneema webbing. (The main is loose foot) The dyneema webbing will slide on the boom much easier than polyester. I got that idea from someone's post here on SBO. The topic is specific to the Catalina forum and as a suggestion, why not convert to an external setup? All it takes is a couple of Harken triple blocks (expensive little buggers), 2 shackles and a turning block. From folks I know who attempted to fix the poor design it just messes up again. The internal setup looks sanitary but I'd like to have $1.00 for every Catalina 30 that I went on where the outhaul was stuck in place. The setting was like the broken clock - it was right for 1 point of sail and wind condition and wrong for all others. You can't adjust draft depth w/o the outhaul. Within the first minute of stepping on the boat I looked at the outhaul and then the fairleads. If both were frozen in place I knew I was in for a long day but also recognized parts of the owners problem with performance. There’s a bunch of reasons why the entire world has moved to internal rigging of halyards, outhauls, reefing lines, etc. Why make a step backward in time? It’s not the internal nature that’s caused them to jam, it’s the 15 years of non-use by the owner. Who cares what the entire world has moved to. It's the old Catalina design he's stuck with that causes the jamb and no amount of use would make it work - once it's stuck that's it. Additionally, drilling out the screws & getting the pot metal end caps off without breaking at least one of them is another problem. Even if the owner fixes the internal setup he's stuck with the downward pulling motion on the slug in the sail track which cause the slug to dig in and create friction. The horizontal pulling motion of the external setup eliminates the friction of the slug -- the slug can be removed if the owner wishes. I'm providing a suggestion that was an easy fix for me. While I can't speak directly to the Cat 30, my Sabre 30 had a very similar outhaul. When I purchased the boat the outhaul for all intents and purposes was nonfunctional. There were 2 problems that made is nonfunctional. First the blocks were cheap Schaeffer blocks and second, the blocks were sized for ¼" line, but the out haul was rigged with 5/16". After rebuilding the outhaul with properly size Harken Blocks and new line, it worked well until I sold the boat. Harken's can be pricey, Garhauer may be a more economical high quality choice. Internal outhauls are technically much superior to external. In particular, a center-line boom end sheave is much superior to an external side mounted block. Not to mention the clutter of a multi-block purchase system. If there are design issues with the original OEM designed system, fix it. There's no question a working outhaul is needed. If the internal one fails I can always rig up an external one but the internal one with line led out the bottom of the boom at the mast end will make it easier to lead back to the cockpit. For this reason I want to give it a try. My loose footed main attaches with a clew strap so no slug to add friction. I'm not talking about making the original outhaul work. I'll be installing all new with new BB exit sheaves, new fixed BB blocks and new line as Stu pointed out. It should work much better than OEM. Ward: Your idea will work nicely for you. Just for the record, the external systems ends up in the original rope outlet area and I easily led the line back to the cockpit. My outhaul project stated the day after I bought the boat. I removed the mainsail and disconnected the boom from the mast. Then lugged the boom (it ain't light) 64 slips to the parking lot. The screws were frozen and had to be drilled out. While removing the end cap I broke it. While waiting for the replacement I painted the boom. I forget which end cap i removed but it was the wrong one to get to the problem area. I had no idea how to re engineer the system. The original looked like it would just mess up again anyway - the swivel was twisting. The external system was easier for me at the time and once I figured it out it took me longer to go to West marine and get it then it did to hook it up. My mainsail is tracked and the line in the exit sheave, for the out haul, pulls the sail parallel to the boom. This inside boom outhaul is always in line with the boom sail track. If sheaves are functional and the track is clean, the outhaul works as designed. 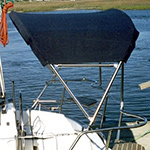 I think of the end boom fitting like the fittings at the mast head for a tracked main sail and a free spinnaker. Different block systems for the different sails. 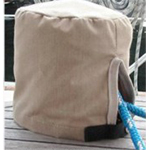 Once the sail is full, it is really difficult to adjust the outhaul due to the sail being full. To increase the tension on the outhaul it is necessary to overcome the pressure on the sail from the wind, that pressure is far greater than the little additional friction from a slight change in the fairlead. If it becomes necessary to increase outhaul tension, luff the sail, increase the tension, and then trim the sail. If the outhaul is in the cockpit, this is pretty easy and quick.